1943. Ludovic Travers, consulting specialist for Scotland Yard, is on a fortnight’s well-earned leave in London from his military posting. Anticipating relaxation, he is instead thrown into a fresh mystery by a letter from one Peter Worrack, the owner of a genteel gambling club. Worrack’s business partner, Georgina, has disappeared. Or has she? Ludo rapidly has doubts, but the reasons for any deception remain obscure until he takes on the case, and finds that the clues he’ll need to consider include the jokes of a radio comedian, a handful of jaded club-goers, the novelty of a mouse in the wainscoting—and someone desperate enough to commit murder most foul. 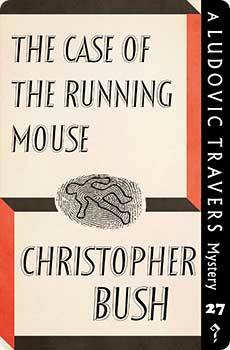 The Case of the Running Mouse was originally published in 1944. This new edition features an introduction by crime fiction historian Curtis Evans.